11.24.06 World Champion Vladimir Kramnik will again meet the silicon monster Deep Fritz in a six-game match contested in the National Art Gallery in Bonn, Germany from November 25, 2006 - December 5, 2006. In their first encounter, these two played an eight-game match to a 4-4 tie in the Gulf state of Bahrain in 2002. Official Schedule, Player Profiles and Kramnik's thoughts on the match are here. Watch Game 1 here via our LIVE Game Link. The players shall each have to make 40 moves in two hours followed by 16 moves per hour thereafter provided that in the event that a game has not been completed within six hours it may be adjourned to the following day at Kramnik's discretion when play will continue at the rate of 16 moves/hour for a further six hours. The winner of the match will be the first Player to score more than 3 points. It is intended to award the winner the World Chess Challenge Trophy. If the match is decided before the six games set out in paragraph ’ÄúDates’Äù have been played, Mr Kramnik will continue to play until the conclusion of the sixth game or offer his services in any way agreeable to both Parties. It is an almost senseless challenge to describe World Chess Champion Vladimir Kramnik in a few lines. His personality has too many facets; his areas of interest are too diverse. What is clear is that Vladimir Kramnik is not solely fixated on chess. Current affairs interest him just as much as numerous sports and cultural activities. What is it that marks out the world champion in him even though he doesn't focus exclusively on chess? People close to Kramnik, who presumably works less obsessively on his game than most of his competitors, often claim that this has something to do with his creative nature and strategic gifts. For Kramnik, chess is less of a sport and more of the art of carrying out a long-term plan. The harmonious interplay of his pieces and the beauty of his game are legendary. In many matches, he sees things that no computer can calculate and no other grandmasters could discover. The ingenious ideas come to him quite easily, providing him with moments of pure joy. The artistic vein in the 31-year-old Muscovite must have been given to him in his cradle. His father Boris is a well-known sculptor; his mother Irina a music teacher. He was once asked, "What would you like to do after the end of your career?" The classical music aficionado and avid reader responded, "Start a family ’Äì and take piano lessons." Kramnik started to play chess at the age of five. At 12, his enormous talent was recognized in Moscow and encouraged. As a teenager, Kramnik got better and better ’Äì at only 16, he won the U18 world championship. The list of his victories is long. He has already finished all major tournaments in the world as the victor. Thursday, November 2, 2000, London: Vladimir Kramnik became the 14th World Chess Champion ’Äì with a 8.5:6.5 victory against Garry Kasparov, who was unable to win a single match. Kramnik had achieved his biggest dream: becoming World Chess Champion. An exultant Kramnik threw his arms up after the decision. The audience's applause and tumult will not be forgotten. After this triumph, Kramnik notched up several major victories at prestigious tournaments such as Dortmund, Linares, Leon and Monaco. In 2004, he faced off in the next World Championship, this time in Switzerland: Kramnik successfully defended his title against the challenger, Hungarian grandmaster Pˆ©ter Lˆ©kˆ„. In a complex strategic battle, he pulled off a supreme coup, winning in the 14th and last match in the game. 2005 was a year of ups and downs for the World Champion. Kramnik was diagnosed with rheumatoid arthritis, entered intense medical treatment, and disappeared from the tournament scene for six months. The break seemed to rejuvenate Kramnik ’Äì the Russian player tackled the huge challenges of his sport with renewed vim and vigor. In the end, 2006 was a year of unmitigated success for him. At his comeback in the 2006 Chess Olympiad in Turin, he had the best individual score of all the 1,000-plus participants. Next, he won the tournament in Dortmund. And then, to top it all, he defeated Veselin Topalov (Bulgaria) in the World Chess Championship on October 13 in Elista, Russia. On the next day, one newspaper accurately proclaimed, "Vladimir Kramnik is the champion of all the classes." The chess community is now awaiting World Chess Challenge 2006 with bated breath. It will be World Champion Vladimir Kramnik's first performance after successfully defending his title. Many experts agree that, with his strong grasp of positions, Kramnik is probably the only human being who can still give the increasingly powerful computer a run for its money. 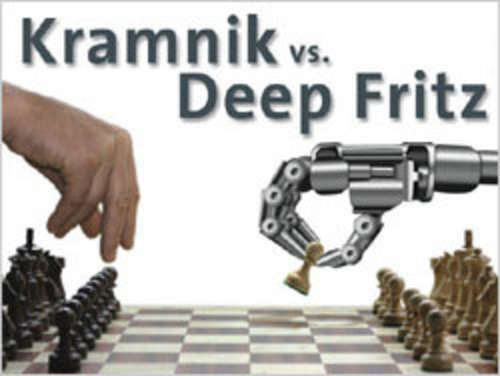 At World Chess Challenge 2006, Vladimir Kramnik will be facing a very strong kind of opponent: Fritz, the world's leading chess computer program, developed by Hamburg-based Chessbase. On a standard 2 GHz notebook, Fritz calculates around 1.5 million positions a second, identifies the most complicated maneuvers and structures in blinding speed, and can draw on a treasure trove of some 3.2 million stored matches. The new version of Deep Fritz was developed specifically for this duel. Not only is it far more powerful than all its predecessors, it contains even more new chess knowledge to counter Kramnik's strategic skills. Deep Fritz will be running on a computer with four processors at WCC 2006. Since the program has been optimized for parallel processing, it will be able to respond quickly and strike hard at a tactical level. On this machine, Deep Fritz can compute around eight to ten million positions a second. That is three times faster than in Bahrain in 2002, the last time it faced off against Kramnik. No other chess engine has been developed with such a strong focus on matches and contests against the world's best players. During its long career, Fritz has played against the scene's stars, beating some of them resoundingly. And Fritz ’Äì with its artificial intelligence ’Äì never stopped "learning". Insights gleaned from tournaments and games played against strong human opponents were incorporated into subsequent releases, making Fritz a program with an uncannily human playing style. Experts consider Fritz to be the program with the best grasp of positions. The chess program was "born" in November 1991 in the offices of Chessbase. In 1985, the Hamburg-based company had developed a computer program for recording and saving chess matches ’Äì a revolutionary concept back then. Fritz, however, was the first real chess program in the Chessbase product line that would make a spectacular entrance on the world stage. Fritz notched up the first major success in its meteoric career in Hong Kong, at the Computer Chess World Championship. Fritz, a floppy-based program running on a normal 386 PC, defeated Deep Blue in the deciding match, becoming in May 1995 the first PC software program in the history of computer chess to be named the World Champion. Soon, everybody was talking about Fritz's powerful game. The top players began to take the new challenge seriously. And Fritz continued to notch up more wins, emerging victorious from high-caliber tournaments in the next several years. Then, in October 2002, Fritz entered one of the most formidable competitions in its career: It squared off against World Champion Vladimir Kramnik in Bahrain. Kramnik captured a two-match lead, but Deep Fritz turned the tables on the World Champion in the next two games: The competition ended with a 4:4 tie. In October 2004, the Man vs. Machine Team Championship came to Bilbao. Fritz's computer team pulled off a resounding 8.5:3.5 victory. Their competitors were internationally top-seeded players. Fritz, who faced these world-class players on a garden-variety notebook, garnered the best individual score. In December 2005, Fritz (Version 9) won the German Game Developer Award and received Second Place for the most innovative technology. Vladimir Kramnik said, "The machine is the clear favorite, but don't discount me just yet. I know some top players would be very nervous about playing the computer ’Äì they might even avoid this kind of match. That's understandable since a cut-and-dried defeat can affect your future game. Of course, this computing monster keeps getting better year by year, month by month, day by day: My opponent will be incredibly strong. But I think I can still beat it. Whenever I can fight, I'm extremely motivated. After all, I might be the last human being to be able to defeat this machine. My team and I will be expending all our efforts to cut this so-called artificial intelligence down to size." WCC 2006 is being organized by Universal Event Promotion GmbH (UEP). "Along with millions of chess fans, I am delighted to be organizing this world-class event with RAG, our strong partner and exclusive sponsor, and Peer Steinbrˆºck, our patron. The Federal Art Hall is a wonderful venue for this duel," stressed UEP Match Director Josef Resch. "In the year of computer science, the man vs. machine duel is more than just a scientific experiment; it is a cultural and sports highlight like no other."